In 2014, both in Oconee County and at the state as a whole, the variability across contests was greater. Voting in Oconee County for the Nov. 6 election did vary by precinct, with the more urbanized parts of the county surrounding Watkinsville producing fewer Republican votes than in the county’s south and far west. The more urbanized parts of the county were less Republican in 2016 as well, but there is no evidence in the 2018 vote that these parts of the county are moving in the Democratic direction. Oconee County had only 20 provisional ballots, and those were processed before the county’s results were certified and filed with the Secretary of State’s office on Nov. 14. Twelve of the 20 provisional ballots were counted. In the final vote in Oconee County, Brian Kemp got 69.8 percent of the vote in the gubernatorial race, and Jim Beck, considerably further down the ballot in the Insurance Commissioner race, got 69.5 percent. Amy Parrish got 73.5 percent of the vote in the Board of Education Post 2 election near the end of the candidate ballot, and Kim Argo got 73.3 percent in the Board of Education Post 3 contest. Oconee County voters, for the most part, did not skip races on the ballot. For Governor, 20,755 cast a vote (out of 20,799 ballots cast). In the Board of Education Post 3 race, 20,265 voted. Three candidates competed in the Governor’s, Secretary of State, Commissioner of Insurance, and Public Service Commission District 3 races, and the Secretary of State race did produce the lowest Republican percentage in the county vote. The range of voting was from the 66.8 percent in the Secretary of State race to the 74.6 percent in the Commissioner of Agriculture contest, or only 7.8 percentage points. At the state level, the picture is much the same in terms of variability across races. In the final count, Brian Kemp won the governor’s race with 50.2 percent of the vote, and Jim Beck, considerably further down the ballot, was elected Insurance Commissioner with 50.4 percent of the vote. The range of percentages for the Republican candidates was from 49.1 to 53.1, or 4 percentage points. Two races will be decided in a runoff on Dec. 4, for Secretary of State and for Public Service Commissioner District 3. Republican Brad Raffensperger got 49.1 percent of the vote on Nov. 6, and Democrat John Barrow got 48.7 percent, with 2.2 percent going to Libertarian Smythe Duval. In the Public Service Commission District 3 race, incumbent Republican Chuck Eaton got 49.7 percent of the vote to Democrat Lindy Miller’s 47.6 percent and Libertarian Ryan Graham’s 2.7 percent. Raffensperger and Barrow move on to the Dec. 4 runoff, as do Eaton and Miller. In 2014, the variability between outcomes in Oconee County and at the state level was greater than in the Nov. 6 election. Nathan Deal got 69.4 percent of the vote in Oconee County in 2014, while Herman D. Everett got 82.7 percent of the vote, for a range of 13.3 percentage points. Four of the races in 2014 had three candidates competing. At the state level, the range of scores was even greater–15.6 percentage points. Party line voting seems to have been strong in 2014, but it was even stronger in Oconee County and the state in 2018. Only four of Oconee County’s 13 precincts produced vote percentages for Kemp that were strikingly lower than the overall county average of 69.8 percent. Those were City Hall, Athens Academy, Annex and Civic Center, all in the urbanized cluster of the county around Watkinsville. The City Hall precinct is dominated by Watkinsville, with 1,300 of the precinct’s 1,685 active, registered voters living in the city limits. The Annex precinct consists of 682 Watkinsville city residents and 1,296 registered voters who live outside the city limits. The county’s 13 precincts are not equal in terms of number of registered voters, and the Civic Center and Athens Academy precincts are among the four largest in the county. Another large precinct–Malcom Bridge–gave Kemp 68.9 percent of its vote, or just below average. Dark Corner, in the far northwest of the county at the Barrow County and Walton County borders, gave Kemp his largest percentage, at 80.4 percent. Dark Corner is the county’s third largest in terms of number of active, registered voters. The other precincts where Kemp did considerably above average are North Oconee and High Shoals in the center-west of the county and Antioch, in the far south. Kemp in 2018 outperformed Donald Trump in 2016 in Oconee County, though not in the state of Georgia overall. Trump got 67.4 percent of the vote in Oconee County, compared to Kemp’s 69.8 percent. In the state of Georgia as a whole, Trump got 51.1 percent of the vote in 2016, compared to Kemp’s 50.2 percent. Both were three-way races. 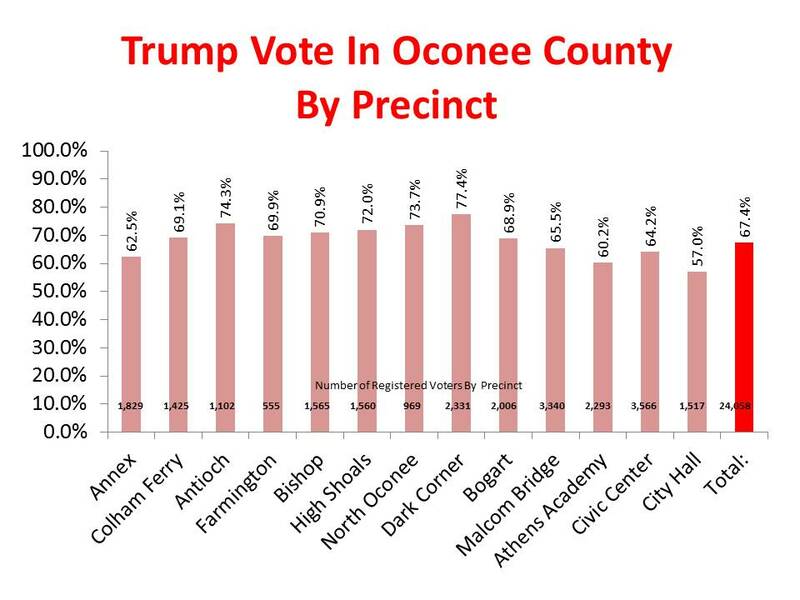 Trump carried all of Oconee County’s 13 precincts by significant margins, but he polled weaker in City Hall, Athens Academy and Annex than in other precincts. 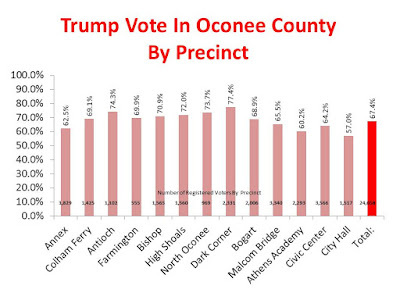 Trump’s lowest percent among Oconee County’s precincts was at City Hall, where he got 57.0 percent of the vote. Trump did best in Dark Corner, where he got 77.4 percent of the vote. In Civic Center, Trump’s percent was 64.2, or 3.2 percentage points below his average county-wide. Trump underperformed in Oconee County on Nov. 8, compared with how Republican presidential candidates fared in 2012 and 2008. Trump got 67.4 percent of the vote in Oconee County in 2016, compared with Mitt Romney’s 73.6 percent in 2012 and John McCain’s 70.8 percent in 2008. In the four precincts where Kemp was weakest in 2018, he outperformed Trump’s 2016 figures. In City Hall, for example, Kemp got 61.1 percent of the vote on Nov. 6, compared with Trump’s 57.0 percent. In Athens Adademy, Kemp got 61.8 percent of the vote on Nov. 6, compared with Trump’s 60.2 percent. While national and state media have noted the changes in the suburban areas of Atlanta that have led to Democratic victories, there isn’t much evidence that Oconee County at this point is reflective of that trend. Kemp bested Trump’s figures for 2016 and nearly matched those for McCain in 2008. He did less well in Oconee County than Romney did in 2012. But Kemp’s 69.8 percent vote in the county is up just slightly from the 69.4 percent that Deal got in the governor’s race in 2014. Despite a high level of activity on the part of the Oconee County Democratic Party, the county’s votes remain strongly Republican. In the end, 75.5 percent of Oconee County’s 27,538 active, registered voters cast a ballot for the Nov. 6 election. That is the second highest turnout rate in the state, for which the final turnout rate was 61.2 percent. As the chart above shows, turnout did not vary greatly by Oconee County precinct. Taliaferro County, just south of Oconee County, had the highest turnout rate with 77.1 percent, and Greene County, which borders Oconee County and Taliaferro County, had the third highest turnout, with 74.6 percent. Oconee County historically has high turnout rates, leading the state in the 2016 November election with a rate of 85.1 percent. As I wrote in an earlier post, Oconee County’s high turnout rate allowed it to have disproportionate influence on the three Georgia House and Senate districts of which it is a part and helps explain the flipping of the county’s two House districts back to Republican control. I have calculated turnout rate based on the number of ballots cast divided by the number of active, registered voters. This is the method used by the Secretary of State’s office. Oconee County went into the Nov. 6 election with 27,538 active, registered voters, and another 1,878 inactive voters, that is, voters whose names were on the rolls but who had not voted in four years. In the Nov. 6 election, more than half of those who cast a ballot did so through Advanced In Person voting, which was held at the Board of Elections and Registration Office in Watkinsville. Just under four in 10 cast a ballot on election day at the 13 precincts around the county, and 4.5 percent cast a ballot by mail. Kemp did just slightly better on election day voting at the polls than he did with Advance In Person voting and much better than he did with mailed ballots, where he received only 55.5 percent of the vote. Not included in the chart above are the 20 provisional ballots cast on election day. These are ballots filled out on paper by someone whose registration could not be verified by polls workers at the precinct. Fran Davis, director of the Oconee County Office of Elections and Registration, told me last week that 12 of these ballots ultimately were accepted and counted. In some cases, she said, the person had voted in the wrong precinct and the votes had to be moved to the other precinct before they were certified. Eight cases were rejected, Davis said. One of the rejected cases was for a felon who had not regained the right to vote. The other seven were for voters who were registered in another county. All of these cases were processed, and results were certified on Nov. 14, Davis said. Election and Registration Director Davis told me in an email yesterday that early voting for the Dec. 4 runoff has not yet been set. “We are required to have our paper ballots in the office when we begin Early Voting and we were just able to place our ballot order this morning,” she wrote. All registered voters are eligible to vote in the runoff. It isn’t necessary to have cast a ballot for the Nov. 6 election. The Oconee County ballot will only include the Secretary of State and Public Service Commission District 3 races. Terrific detailed analysis, Lee. Thank you!